College football fanatics rejoice! As the end of the 2016 season approaches, Georgia Aquarium is gearing up for an exciting month of activities including College Football Day and the Chick-Fil-A Peach Bowl Fan Night, both happening in December. On Wednesday, Dec. 14 from 11 a.m. to 2 p.m., Georgia Aquarium is kicking off College Bowl Season with an interactive afternoon of football-related activities at College Football Day! Guests are invited to the Recognition Rotunda (level two above Café Aquaria) for classic tailgating activities like corn hole and a football toss. Those who wear their favorite team’s jersey or colors will receive a free Georgia Aquarium souvenir football. Additionally, all are welcome to take selfies at our photo booth, which will be stocked with fun props! Later in the month, University of Alabama and University of Washington fans alike are invited to prepare themselves for the 2016 Peach Bowl at Georgia Aquarium’s Chick-Fil-A Peach Bowl Fan Night! On Dec. 30 from 4 p.m. to 8 p.m., guests can expect to see an exciting performance from the cheerleaders of both teams as well as a band pep rally. Additionally, a cash bar and food court will be available, as well as an exclusive evening presentation of Georgia Aquarium’s spectacular AT&T Dolphin Celebration. There’s no better way to get pumped for this year’s Chick-Fil-A Peach Bowl, which is being hosted right here in Atlanta! College Football Day activities are included with the price of admission and Chick-Fil-A Peach Bowl Fan Night performances are included with the purchase of a ticket, so come root your team on! 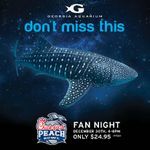 For more information or to plan your visit, head to georgiaaquarium.org.